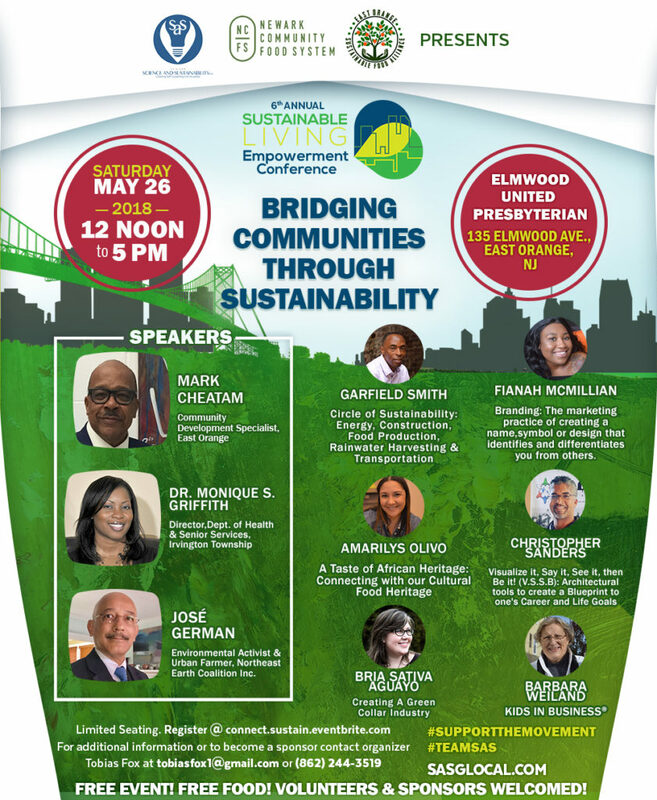 Newark Science and Sustainability, Inc. (Newark SAS) and the Newark Community Food System (NCFS) in collaboration with East Orange Sustainable Food Alliance (EOSFA) presents the 6th Annual Sustainable Living Empowerment Conference: Bridging Communities through Sustainability. This event will be held on Saturday, May 26, 2018 from 12 noon until 5:00 p.m. at Elwood United Presbyterian located at 135 Elwood Avenue, East Orange, NJ 07018. The purpose of this sponsor-based conference is to inspire and empower attendees, so they become active participants toward the goal of building healthy, sustainable communities. The speakers involved use their own experiences and values to convey how they have been driven by their passions to various achievements. From urban farming to spiritual wellness to solar technology and climate change, the speakers share information and experiences that assist with the creation of sustainable communities. Empowerment is a multidimensional social process that helps people gain control over their own lives, communities, and in society by acting on issues they define as important. This event is free and open to the public. Volunteers and sponsors are welcomed. Limited seating. Register @ connect.sustain.eventbrite.com. For more information contact tobiasfox1@gmail.com or 862.244.3519. Posted in Blog, Community Gardening, Glocal, Renewable Energy, Sustainability, Urban Agriculture and tagged Nutrition, Renewable Energy, Sustainability, Urban Farming, Wellness.